Having a double mastectomy reduces the risk of premature death in healthy women carrying a breast cancer gene, new research has revealed. 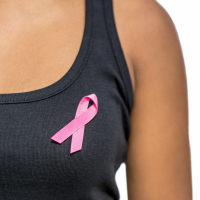 The same study found, however, that undergoing a double mastectomy, or bilateral risk-reducing mastectomy (BRRM), made no difference to the life expectancy of women with another faulty gene, mutant BRCA2. In May 2013, Hollywood star Angelina Jolie had both her breasts removed after discovering she carried the BRCA1 gene. Two years later, she had her ovaries removed, as BRCA mutations also raise the risk of ovarian cancer. The new study, conducted in the Netherlands, tracked the progress of 1,696 BRCA1 mutation carriers and 1,139 BRCA2 mutation carriers who opted either for BRRM or careful surveillance. All the women were healthy with no previous history of cancer. BRRM "drastically reduces the risk of developing cancer"
Lead researcher Dr Annetee Heemskerk-Gerritsen said: "For BRCA1 mutation carriers, bilateral risk-reducing mastectomy not only drastically reduces the risk of developing breast cancer, but, as a consequence, also improves breast cancer-specific survival when compared to surveillance. BRCA2 cancers tended to be diagnosed at an older age, for example, and had more in common with normal cells. They were also more likely to be hormone-sensitive. We offer a range of medical travel insurance packages. Get your specific insurance here before going on holiday.